Edgware is a suburb of north-west London centred 11 miles from Marble Arch, up the A5 on the way to St Albans. It is divided between three boroughs: 50% in Barnet, a bit less than 50% in Harrow, and a small part in Brent. I live in the Brent part, one mile from Edgware town centre. Apparently Edgware town centre is suffering a decline. I say "apparently" as I don't know, as I almost never go there, because it is horrible, and there is nothing there of sufficient interest to draw me to make the not very nice (by any method) journey there. I think Edgware town centre has long had problems. The suburb grew entirely due to the construction of the Northern Line of the London Undergound in the 1920s, of which its station formed the terminus of one branch, and, with efficient, direct connections to both the West End and the City, it was always predominantly a dormitory. The so-called High Street, part of the A5, is nothing like a high street, except at the war memorial, with a few slightly villagey-looking shops and restaurants surrounding it. Most of the High Street consists of car showrooms, car maintenance businesses, warehouses, and storage sheds, with a few seedy shops and "cafs". Development of the High Street, my neighbour (who has lived in the area all of his 88 years) tells me, was aborted by the development of Station Road, the road in which the Underground and bus stations are located, when the Northern Line came. Station Road became the main shopping street of Edgware, its affluent middle-class intentions signalled in the somewhat grand redbrick 1930s architecture of some of the shops and flats above them, and featuring one big, impressive pub, the Railway Hotel, built in mock "Stratford-upon-Avon" tudor style. 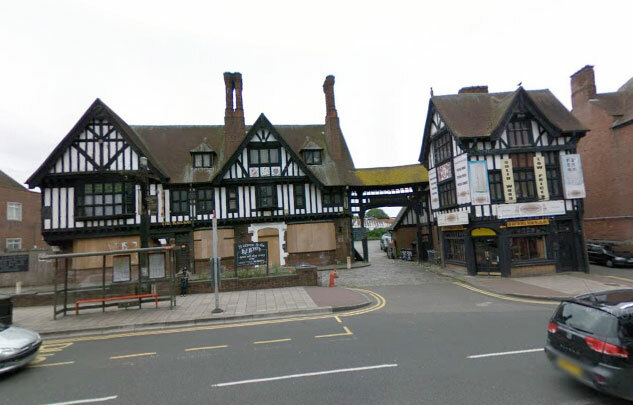 The Railway Hotel is a suburban icon that now stands empty, falling-apart and uncared for by anyone, it would appear, including the Borough of Barnet. The prosperity of Station Road was, in its turn, usurped by the construction of a covered shopping mall off of it, in the 1990s, now called the Broadwalk Centre, including a Sainsburys supermarket and a massive car-park. The spiritual and public centre of Edgware should be the crossroads of Station Road, the High Street, and Whitchurch Lane (which leads to the church of St Mary, where Handel once played the organ and rehearsed his works). By this crossroads stands the parish church of St Margaret of Antioch. 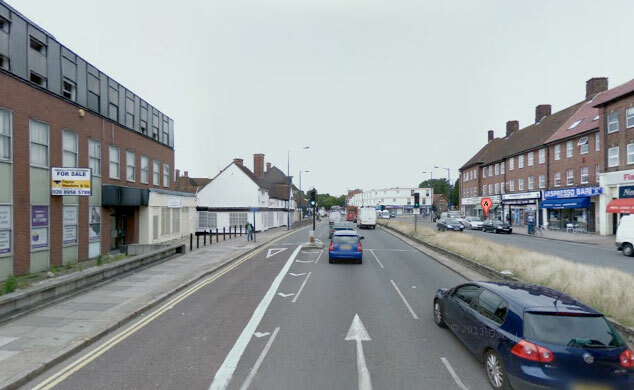 But this crossroads is dominated by through-traffic on the A5, and another massive 1930s pub – a very ugly one this time, the Masons Arms, and dismal, cheap 60s or 70s concrete architecture housing betting shops and fast food joints. One big office block was built in Edgware, I guess in the 1970s: Premier House in Station Road, which at one time was the HQ of the Green Shield Stamps empire (who is old enough to remember licking those for their mum?). But it doesn't seem to have brought much benefit to the area. Just beyond this, going up Station Road, is the pedestrian entrance to the Broadwalk Centre (they ban bikes, one reason I do not go there), and then the bus station, cramped onto a very unsatisfactory site which means that buses have to go in and out on the same narrow road, making a tight right-angle turn off Station Road, the in and out flows of buses crossing over within the bus station. The bus station also has the habit of playing excruciating mock-baroque "easy listening" music to anyone unfortunate enough to be stuck waiting there, apparently to deter the "yoof" loiterers. On weekdays during the rush hour, Station Road suffers from massive congestion, with extra pollution from the large number of buses using it and the bus station. It is a very poor walking environment, with staggered two-stage crossings with islands and cages for pedestrians to negotiate, and walking-unfriendly, wide-mouthed side road junctions at roads such as Manor Park Crescent and Edgwarebury Lane, plus a profusion of pedestrian "safety" barriers (because pedestrians can't be trusted to cross in the "right" places, and cars can't be trusted to stay on the roads). The worst place is between the A5 crossroads and Premier house, where the road in and out of the Broadwalk car park interrupts pedestrian progress on Station Road with an utterly inappropriate five lanes of traffic at a signalised junction where it seems to take forever to get the green man to get across. Needless to say, there is no safe or appropriate way to cycle into this car park, though there is a bit of cycle parking there. There is a narrow, mal-designed cycle lane which skirts the inbound lifting barriers, but, as pedestrians also seem to have no properly-designed route from this part of Station Road to the car park, they walk here, understandably. There are several narrow pedestrian footpaths that also lead into the car park from other directions, but they all ban bikes. Churchway, Edgware, the dismal place where five lanes of traffic in and out of the Broadwalk car park meet Station Road. 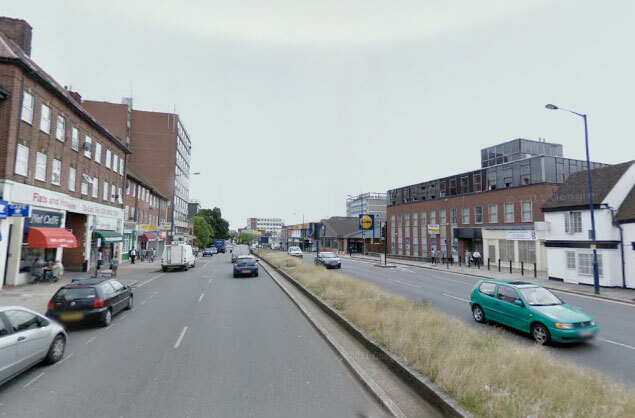 Edgware epitomises, in my view, much of what has gone wrong with British town centres, which are now failing, with their confusion between the transport and social and commercial functions of roads and streets, and their enslavement to planning for people in cars. There is no attempt at what you see in Dutch towns as the core of planning policy, the separation of "roads for movement" from "streets for communities". Edgware has a by-pass, has long had it, the A41 Edgware Way dual carriageway. This has no shops on it, is almost parallel to Station Road – running only, at minimum, 500m north of it – and so should carry all the through-traffic. But in the normal British way, the construction of the bypass was not accompanied by the removal of the town-centre from the through-traffic system. So every road is clogged by cars, parked and moving, which have multiplied to fill all the space allocated to them, with short, unnecessary car journeys facilitated at almost every point by the planning decisions that have been taken. So when I found, though the Barnet Council website, this video about Edgware, entitled Portas Pilot: Station Road, Edgware, I was intrigued to know what it would suggest for improving the area. Having watched it, I have to say I am none the wiser as to what this "Portas" vision is. If you view this on the YouTube site you discover that there is a whole gentre of these Portas Pilot videos, from all over the country, including one from Sussex entitled, slightly amusingly, Seaford Shags Portas Pilot bid. There seems to be a small industry of producing these videos. Well, I can't see how the production of these videos is going to save one failing town centre. The Edgware video gives quite a good impression of what the place is actually like, and shows most of the features I have mentioned above. But there is no planning or public policy solution here, just well-intentioned, but empty, blather and piffle from a variety of people. 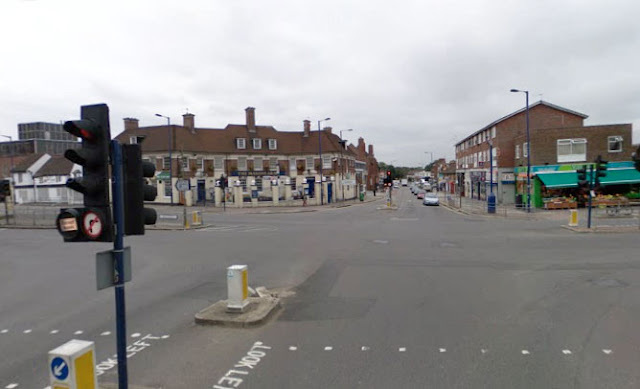 In fact, worse, it contains just more of the same historically-failed thinking as before, coming from the policeman, who thinks it important that it is made easier for people to park to access the shops that are not in the Broadwalk Centre, while we see, behind him, a Station Road full of parked cars. 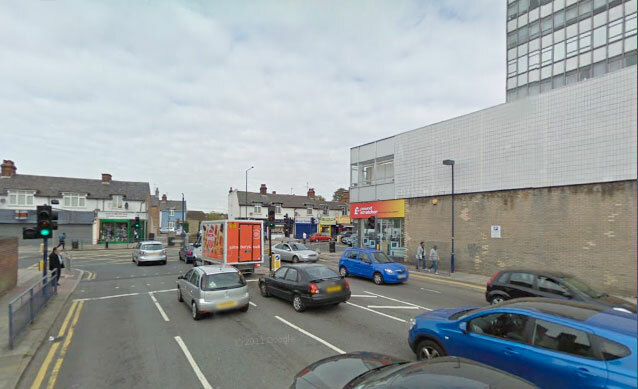 I won't go here into all the evidence that shows that, even in apparently car-dependent places like this, most journeys to shops are not by car, and most expenditure in local shops is not by people arriving in cars. I won't go into the lack of evidence that exists for the slightest relationship between the provision of car-parking, its cost, and the success of shopping centres. A good post was provided on this subject on At War With The Motorist – see also many other relevant posts on that superb blog. All I'll say is this: People who wish to drive to a shopping centre, park in a huge free car park, and wonder round a covered mall, have ample opportunities to do such, and good luck to them. There are huge roads provided for them to get to these places, and they use them, in this area to access the Brent Cross Shopping Centre (which certainly has played a major part in undermining NW London centres like Edgware over the last 40 years), Westfield at White City, Westfield at Stratford, The Harlequin in Watford, St Anns Centre in Harrow, and so on – maybe even Bluewater in Kent. Other people want something completely different. I mean, completely different, as an experience, and will look for where they can find it, or satisfy all their shopping needs from a comfortable keyboard at home, and their social needs in other places. Edgware town centre, only one mile from my house, will not be seeing much of my custom in the foreseeable future. What would it take to get me there? Well, if the boroughs or Transport for London built me a convenient and safe bike route to get there, that would be a big thing. What that would have to mean in practice would be Dutch-style segregated cycle tracks along the A5, which is amply wide enough to take them. What else? Pedestrianise Station Road, at least during business hours. Demolish the ugly buildings and restore and care for the nice ones. Use the vast area allocated to car parking better. Create more intelligent access arrangements for the buses, and allow cycle access everywhere. You are still the weakest link, so it's goodbye from me. Naturally enough, that's because the streets of Edgware are designed for people passing through, in motor vehicles, and not for the people who might want to stop and hang around. Unfortunately, from what you have written, and from the rest of the video, nobody in Edgware seems to have appreciated that this is the fundamental problem. The videos are produced by an organisation in the local community, say the chamber of commerce or the AAP, as part of the community's bid for a share of the Portas money (12 towns will share £1m). Edgware Town will have completed a more detailed written submission stating what they think the problems are, how much they want, what they'd do with it, the KPI's & how they'd measure them. Thanks for that information, T Foxglove. So that's £83,000 for each town centre. I wonder what that will achieve. There have always been shops on the A41 Edgware Way. I bought buns from Grodzinski there in 1969! A bit of history from someone old enough to remember Green Shield stamps: The Broadwalk Centre was built on the site of a larger bus station, which was closer to the street. Premier House, referred to as the big office block in Station Road, Edgware, was built as Green Shield House at the very beginning of the 1960s. I watched the yellow tower crane construct the building (Wates was the principal contractor). At one time, London Borough of Barnet rented space near the top floor as their local planning office. Building since converted into a block of flats with new facade.